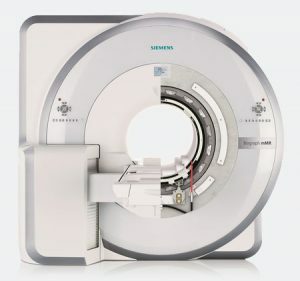 The device is adapted to simultaneous examination of the whole body by means of two positron emission tomography (PET) and magnetic resonance modes. It is one of two scanners of this type in Poland. The scanner is suitable for testing the whole body in a magnetic field with a size of 3 T. The diameter of the gantry is 60 cm, and the length of the bed is 199 cm. The system includes 18 independent RF receivers. The PET detector contains 56 detector blocks in each of the 8 rings. The field of view in the “z” axis is 26 cm. Matrix of detector blocks made of LSO crystal, light pulses are recorded with avalanche photodiode (APD). Independently to the PET / MR examinations, this device can perform independent magnetic resonance imaging in the full range. The scanner is equipped with coil systems enabling accurate examination of soft tissues, breasts, spine of small and large joints and lesions on the surface of the body. The anatomical, functional and metabolic information obtained in this way is of high resolution due to the high intensity of the constant magnetic field, which is 3 Tesla. The scanner can be used for early detection of lesions which can be a decisive factor in the selection of treatment planning and therapy monitoring.